Drs. Litner and Solieman are double board-certified experienced facial plastic surgeons that work together on each case. What will a minimally-invasive neck liposuction achieve? Your satisfaction with your face is our ultimate concern. At your neck consultation, the doctors will measure the fat distribution of your neck and assess your skin elasticity. They will provide a detailed explanation of everything pertaining to your customized case, including your goals, possible risk factors, how to prepare and how to quickly recover. The procedure will be done by both doctors to ensure most accurate, tailored results. The doctors are dedicated to patient care and will meet you for follow up appointments as needed. 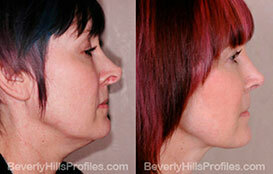 At Beverly Hills Profiles, we want you to feel proud of your neck liposuction and if you are not happy with the results of the first procedure, the doctors will perform a touch up procedure at no cost to you. Say goodbye to your double chin now! Price $5,500-$6,000 $2,500-$3,000, anesthesia included. How It Works & Number of Treatments Injections contain deoxycholic acid, a molecule that breaks down fat. 2-6 monthly sessions are required to reach results. Through 1 tiny hidden incision, the doctors insert a tiny liposuction cannula, remove excess fat and sculpt a natural contour in 30 minutes single session. 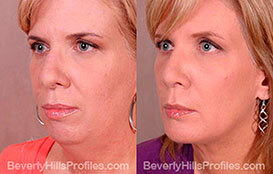 Candidates Patients with local fat under chin. Treats local fat under chin; can also trim turkey necks if combined with lift. Injections Up to 30 injections, divided to sessions. One injection of local anesthesia. Risks and Side Effects Maker says side effects include 2-4 days of swelling and bruising after each session, lumps from uneven injections and even facial nerve injury. Minimal side effects – possible mild swelling and soreness for a few days. Recovery Area is red, hot, bruised and swollen, requiring. 2-3 days of downtime after each session. Patients wear a supportive chin strap for about 3 or 4 days after the surgery, return to work after 5 days in most cases. Results Results may not last long, not enough data. Results are permanent with no significant weight gains.